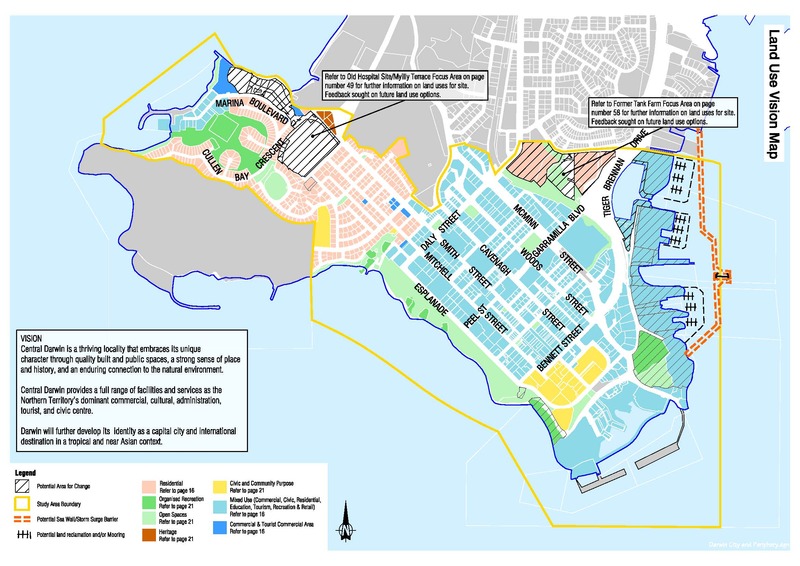 When complete, the Central Darwin Area Plan (CDAP) will provide long-term guidance for land use and development for areas from the Waterfront to Cullen Bay, including Frances Bay, Larrakeyah, the former Tank Farm and the city centre. This project is an opportunity to bring together and build on previous studies, projects and consultation to strengthen Central Darwin as the heart of a vibrant, functional, and attractive capital. Area Plans are land use and development policies within the Northern Territory Planning Scheme which guide the future use and development of land and provide a detailed framework for land use change. These plans contain planning principles and objectives to give the community, industry, and decision-makers confidence and understanding about potential land uses. Area Plans in the Darwin region build on the overarching direction provided by the Darwin Regional Land Use Plan. Planning is informed by population and infrastructure studies with stakeholder and community feedback being a key influence. Area planning also provides an opportunity for authorities like Power and Water Corporation and local councils to plan for future infrastructure services such as power, water, and sewerage. There are two main components to an Area Plan. The land use vision map shows where opportunities for land use change exist. The planning principles clarify the vision and requirements that apply to future development in the areas covered by the Area Plan. An Area Plan must be considered by the Minister or the Development Consent Authority whenever a rezoning or development is proposed. Area Plans do not alter existing use rights and land can continue to be used in accordance with the current land-use zone. Area Plans also do not automatically rezone land. If a landowner wants to develop in accordance with the Area Plan, the landowner must first rezone the land by applying to the Minister responsible for administering the Planning Act. Area Plans try to look as far ahead as possible but, in time, they may be reviewed to meet the future needs and aspirations of the community. Any change to an Area Plan is a Planning Scheme Amendment and must follow the process set out in the Planning Act, including public exhibition. This project is being undertaken to provide a vision for the future of Central Darwin and to prepare for development challenges associated with the growing and diversifying population in the capital city. Two documents were included in stage 2 of consultation. 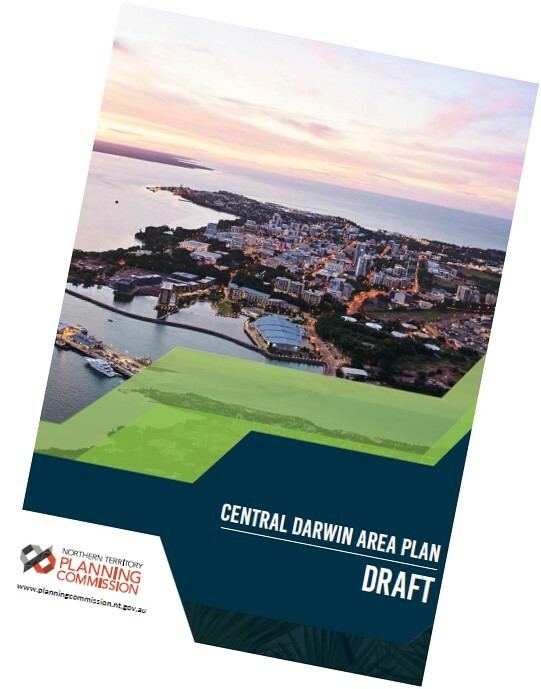 The draft Central Darwin Area Plan (22.1 mb) is a vision to guide the future development of land within Central Darwin. The Area Plan will inform the assessment of requests to vary scheme provisions, change land use, and/or rezone property. The Area Plan is accompanied by a draft Needs Assessment (3.3 mb)which contains a record of investigations and community feedback that has informed the Area Plan. The Needs Assessment is intended to sit within the background documents section of the NT Planning Scheme. It is recommended that the Needs Assessment be consulted where there are questions about interpretation or the policy positions advocated for by the draft Area Plan. The Central Darwin Area plan is being developed over three stages. Stage One occurred from 24 October 2017 to 24 November 2017, and included the release of a discussion paper and first round of up front community consultation. Information stalls were held across the study area and written submissions were invited. Stage 2 consultation on the Central Darwin Area Plan has now closed. All feedback from this consultation will help us develop the final Area Plan which will be recommended to the Minister for Infrastructure, Planning and Logistics for public exhibition as a proposed Planning Scheme Amendment. These documents are located on external websites. They will open in a new window.